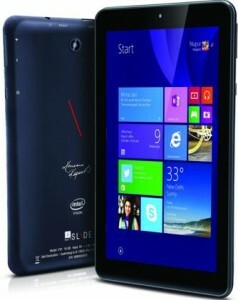 iBall smartphone maker collaborated with the Microsoft Windows Operating system provider and launched the new 7 inches HD display Tablet in country with Affordable price range of Rs. 4999. Its the device for those who loves to use the Windows latest operating system for smartphone with Powerful Processor. iBall Slide i701 offers the 7 inch IPS display with HD resolution of 720*1280 pixels density. It carries the quad core intel Atom Processor with 1 GB of RAM (DDR 3) and 16 GB built in Sotrage, is expandable upto 32 GB. Its not for the Photography lovers, It is for those who need speed and power with Larger screen. Tablet housed with the 2 MP rear camera and Front VGA camera. More importantly it has the 3200 mAh powered battery. So the device has the Processing power and Long run battery, which is best for Gaming lovers. 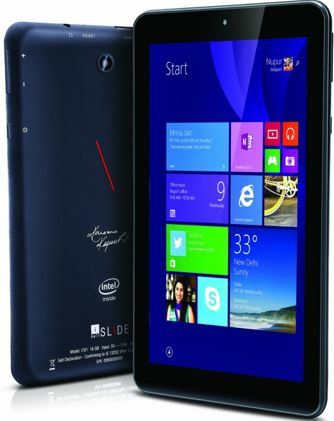 iBall Slide runs on Windows 8.1 Operating system. Moreover its upgradable to the Windows 10. Buyers will get the 1 TB of OneDrive cloud storage and access to all popular apps on Windows Store. You’ll get the Free HDMI cable and three interchangeable vibrant protective covers to boost smartphone experience. More interestingly company also offers the Rs. 1,199 worth goodies with each purchase. iBall Slide will be available on Leading E commerce sites from 21st of May. Its the World most economical Windows Tablet price tag of Rs. 4,999. iBall is best known for the Advanced Battery it provides at affordable range. Recently they also launched the 4400 mAh battery powered iBall Slide 3G Q45 Tablet in country, which provides last longet backup and talk time.